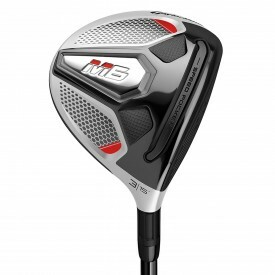 Like the M5 Driver, every M6 driver has been built with the new Speed Injected Twist Face and Hammerhead technology and is available with full custom options.. The Speed injection allows TaylorMade to get closer than ever to the legal limit allowed for a golf club. The usual process involved in designing a driver is to build the face up to meet the legal limit. The problem with this method is due to the inconsistent nature of golf club build, one driver can differ to another and the COR can be difficult to make consistent throughout the range of drivers produced through the year. TaylorMade have addressed this problem by first of all making all of their new drivers exceed the legal COR. Then by using a tuning resin, they have been able to adjust the driver head to meet the legal COR requirements. The new Hammerhead 2.0 is the upgrade version of the technology used in the M3 and M4 model. An increased flexibility in the Hammerhead slots creates a club face that generates huge amounts of ball speeds across the face including off-centre strikes. A New aerodynamic shaped design has allowed Taylormade to introduce a new Inertia Generator .Taylormade have used 54% more carbon than they used in the M4 model which has allowed them to store 46 grams of the driver head weight towards the back to provide the highest amount of forgiveness ever achieved by a Taylormade driver. TaylorMade’s patented adjustable hosel allows a movement of +/-2 degrees of loft and allows you to dial in the M6 driver for maximum performance. Welcome to TaylorMade’s most forgiving driver to date.